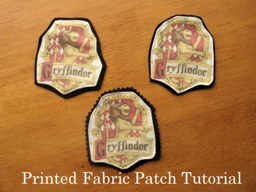 Chris from Pickup Some Creativity wanted to add some patches to her kids’ Harry Potter Halloween costumes. It would have been nearly impossible to find them in a store to buy, so she made her own using her inkjet printer. She shares a tutorial showing how she did it. Get the tute.